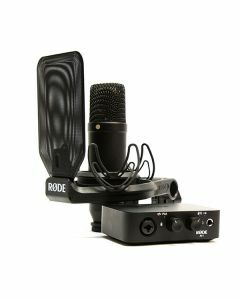 The Rode AI-1 Complete Studio Kit features Rode's first USB Audio Interface, the NT1 condenser microphone, SMR shock mount with pop shield as well as a 20 foot XLR cable and a USB-C to A cable, making this an ideal package for the home studio or mobile studio. Live 9 Lite is a customized version of the music making software Ableton Live. The AI-1’s single input is a Neutrik Combo Jack, which takes both a 3-pole XLR (common to most microphones) and a quarter-inch jack common to most electric instruments like guitar, bass et al. Layering tracks is as easy as plug in, set level and go.